The University Boat Race is one of the River Thames’ best known events on the calendar, attracting a cross section of supporters, sponsors and spectators from across the UK and internationally. For those of you who’ve been living under a rock, the Boat Race is an annual contest between two rowing crews from Oxford and Cambridge Universities. The first race took place in 1829 in Henley on Thames following a challenge between two school chums and has been repeated annually, except during the First and Second World Wars. The date of the race varies each year, usually falling on the last weekend of March or the first weekend of April, subject to the state and time of the high tide. The race is rowed upstream, with the assistance of the incoming tide behind them, usually starting an hour before high water. 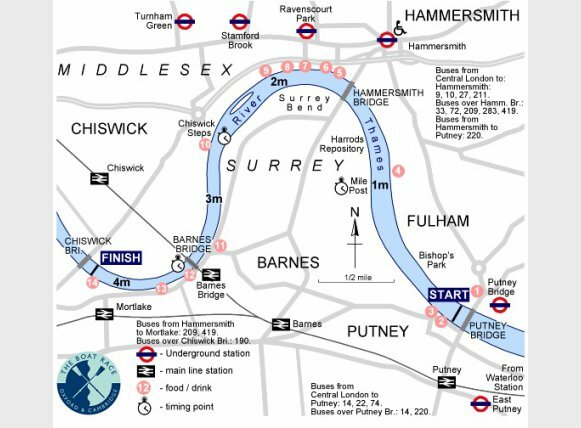 Today, the race takes place between the University Stones at Putney and Mortlake with the start line just upriver of Putney Bridge and the finish line just before Chiswick Bridge. The course is 4 miles, 374 yards (6.8 km). This course was first used for the Boat Race in 1845 and has been used for every race since, apart from 1846, 1856 and 1863 when the race was held in the opposite direction between Mortlake and Putney. Training for The Boat Race starts in September of each year with many hopeful rowers being eliminated as the season progresses. Sessions are rigorous – two or sometimes three times daily as well as gym and weight sessions; and that’s on top of a full day of studies! Three to four weeks prior to the race the crews will be announced to the press and public, accompanied by the official weigh-in – weights and heights of the crews are recorded and the speculation begins over which team has the advantage. The boat race is not just a man’s domain – the first women’s race took place in 1927 on the Isis in Oxford, with (according to The Times) “large and hostile crowds gathered on the towpath” as the men objected to women rowing. In the 1960’s the women’s race become a permanent fixture although it was rowed at Henley rather than Putney. This year, for the first time ever, the Newton Women’s Boat Race will take place on the same day and course as the men’s race. Cambridge currently leads the series with 81 victories to Oxford’s 79, with one dead-heat in 1877. Head down to the Putney Embankment on 11th April and you’ll see both the Elizabethan and Erasmus moored at Putney Pier, supporting the rowers. You can also join in the fun by settling into one of the many pubs along the Embankment. 12 Mar	This entry was published on 12/03/2015 at 4:09 pm. It’s filed under Uncategorized and tagged boat race, Cambridge Universities, Oxford, The Boat Race, The University Boat Race. Bookmark the permalink. Follow any comments here with the RSS feed for this post.